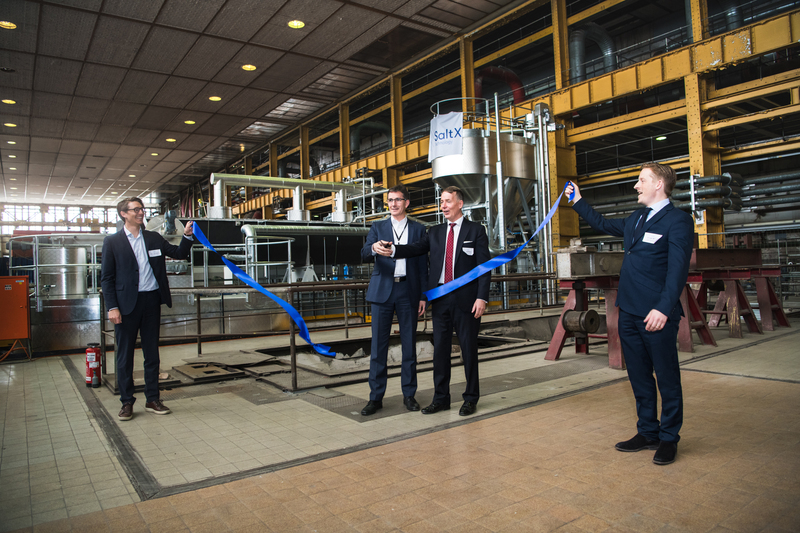 The energy storage company SaltX Technology - listed on Nasdaq First North Premier – has during the day officially opened the large-scale pilot plant together with Vattenfall. It was a great interest from both the press and the energy industry. Vattenfall will evaluate the storage technology with nanocoated salt during the next couple of months. The next step for the company is to evaluate the results together with both Vattenfall and other stakeholders in the coming months in order to bring the industrial energy storage solution closer to a commercialization. A number of large European energy companies attended the inauguration. They are looking for large-scale energy storage solutions that can balance the network and supplement the coal power. Per Thöresson, the Ambassador of Sweden in Berlin attended the Grand Opening. “In the next few months, we will collect important data to get answers to the question of whether and how this type of plant can be used in our business. Some questions are how large amounts of salt can be used, how quickly the storage medium reacts and how the process can be controlled,” said Markus Witt, responsible for the project at Vattenfall Wärme Berlin AG. ETIA, Energiforsk, Öresundskraft and Göteborgs energy, and the Swedish Energy Agency which participate through fundings. During the summer of 2017, SaltX and Vattenfall initiated a collaboration to construct a large-scale energy storage based on SaltX solution with nano-coated salt (NCS). The plant has been installed, tested and commissioned at Vattenfall's combined heat and power plant, Reuter-C in Berlin. The next step for the parties is to perform actual testing of the energy storage for a number of months to evaluate both technology and functionality. The energy storage have a capacity of 10 MWh / 0.5MW, which is charged with electricity from the grid and discharge high-quality heat into the Berlin district heating network. SaltX Technology develops and sells patented energy storage technology, which is marketed under the brand SaltX ™. Customers consist mainly of major global OEM partners such as Alfa Laval, Mobile Climate Control and Rheem. SaltX Technology's stock is listed on Nasdaq Stockholm First North. FNCA Sweden AB, +46-8-528 00 399, info@fnca.se, is SaltX Technology’s Certified Adviser. For more information, visit www.saltxtechnology.com.